Dr. Chacko and his staff are amazing. Girls at front desk are always so welcoming and friendly. 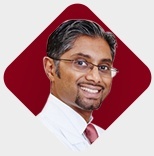 Dr Chacko has been treating my neck & lower back pain for a year now and I couldn’t be happier with the services provided and ease of appointments and wait times. Honest, straightforward, accurate assessments and pain care. Dr. Chacko is very helpful, he helps me with my decisions about my health, and his treatment is effective in treating my knee pain. Dr Jeffrey Chaccko and his staff are very professional and caring. I was in a very bad car accident in May 2017 that left me disabled for the rest of my life. I had been going to a physical therapy place for 3 months and receive horrible treatment until I was referred to him. The first visit he looked at my x-rays and diagnosed what was wrong. He immediately prescribed the right medicine and therapy. I couldn't have asked for a better doctor.